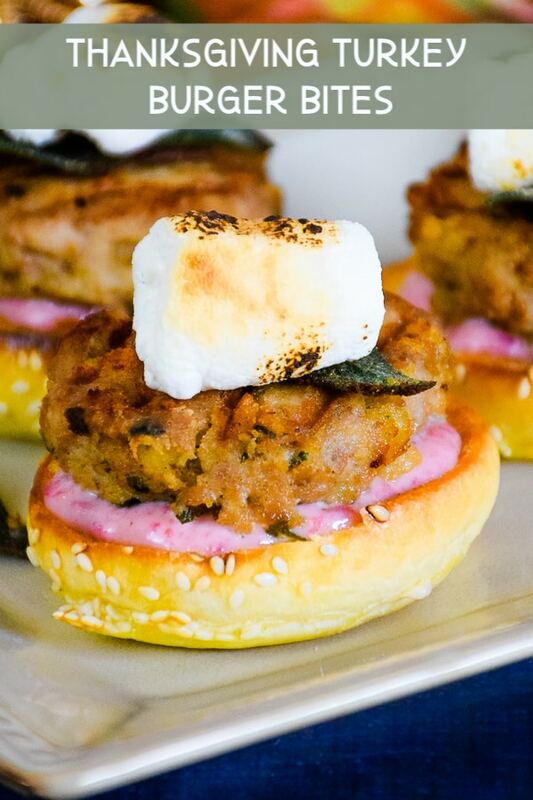 Thanksgiving Turkey Burger Bites are made with leftover stuffing, crispy fried sage, cranberry mayo, and topped with a toasty marshmallow! This mini burger brings together the sweet, salty, and savory flavors from your Thanksgiving table in incredible mouthwatering burger bite! I love Thanksgiving, don’t you? I mean, what’s not to love? There is turkey, stuffing, cranberry sauce, gravy, and pumpkin pie. Need I really say more? It’s just an absolutely delicious holiday! So, don’t let the marshmallow fool you here! First of all, it’s only 1/2 of a marshmallow. Secondly, the slightly sweet combo of the buttery crispy fried sage combined with the mushroom is phenomenal! If you don’t have a way to safely toast your marshmallow, I suggest microwaving it for a few seconds (about 5) just to warm it up. You can also just skip the marshmallow all together if you wish. The cranberry mayo is not sweet. It has just a hint of cranberry flavor with just enough touch of acid from the lime to make it perfectly delicious. I can see this being a great alternative to your turkey sandwich also! The one thing I always loved the most about the holidays was the leftovers. My mom made these amazing dinner rolls They were always so tall and fluffy and the texture was perfect. 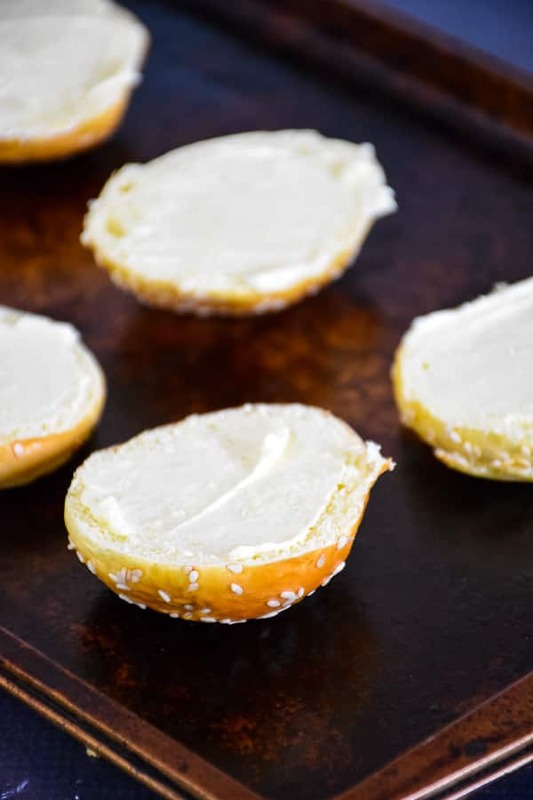 Years ago I did find a dinner roll recipe that I love to make and if I had these around when these burgers were made, I would have used that roll for the bun. We aren’t the biggest bread eaters here since we do a low carb lifestyle (for the most part, we aren’t perfect! 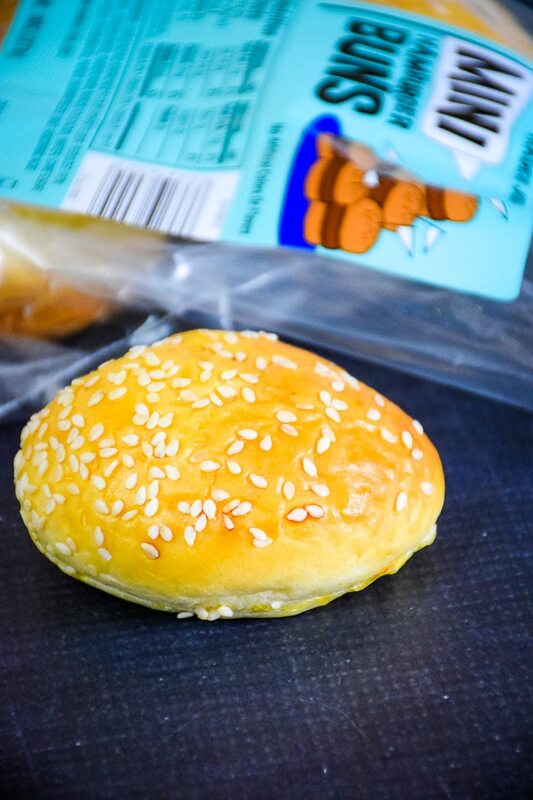 ), I was super excited to find mini hamburger buns at my last Trader Joe’s shopping trip! These were perfect and smaller than most slider rolls. 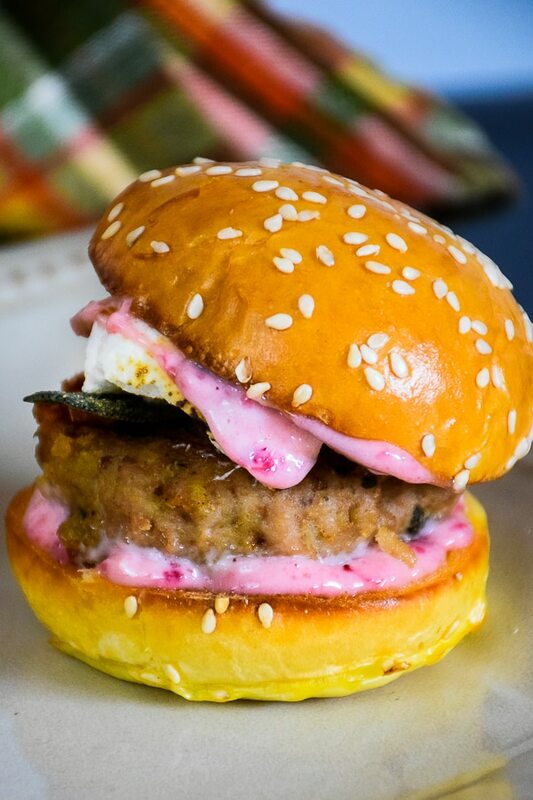 What do you need to make this awesome little Thanksgiving Turkey Burger Slider? Cranberry Mayo Spread, made with cranberry sauce (whole berry), Mayonnaise and lime juice. 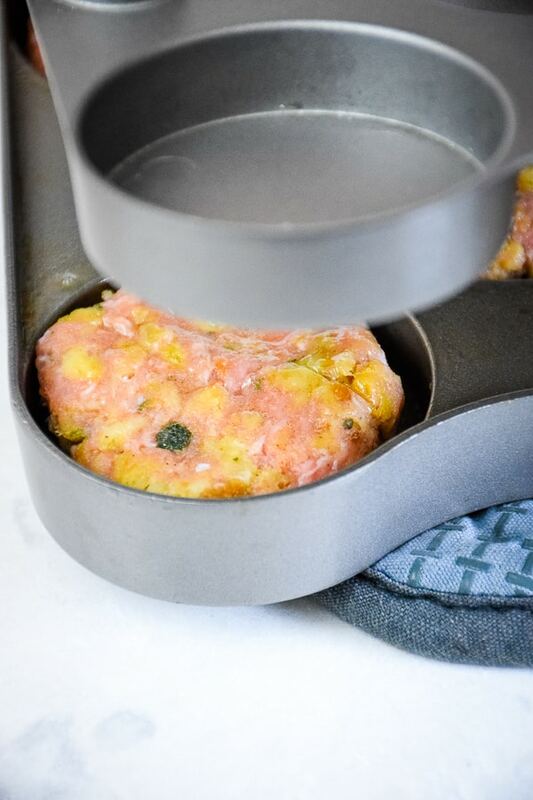 Turkey burgers made with leftover stuffing, butter, and crispy fried sage. Extra pieces of crispy fried sage (for topping the burger). How do you get the perfect sized mini burgers for these sliders? I love how the pan has the little gridlines to make “grill” marks on your burger! The grid lines are on the bottom of the pan as well as on the cover that you use to put over the burgers. This is so you can cook them without flipping and still get grill marks! 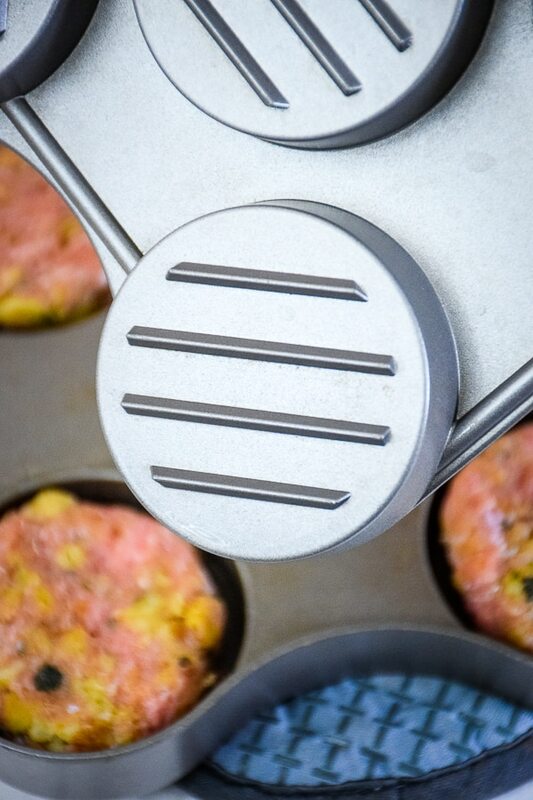 This fancy little pan also will cook six sliders at one time. That works out perfectly for the two of us as I will eat two and Grumpy will eat the rest for the main course. 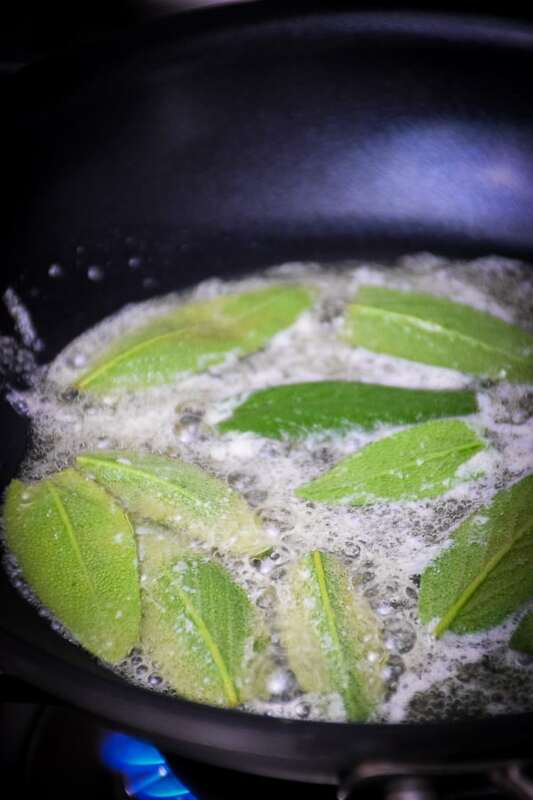 Have you ever made crispy fried sage leaves? These gorgeous leaves came from my Mom and Dad’s garden this year. Fried in some salted butter, they are so delicious! I also couldn’t let that beautiful sage flavored browned butter go to waste. So, I decided to add it to my ground turkey burger mixture! I’m a big advocate of waste not! The turkey burgers alone were delicious. If you are one that likes crispy, buttery stuffing edges, then you will love these! The stuffing and butter in the mix allowed the burger to crisp up a little. These are a definite must try burger! 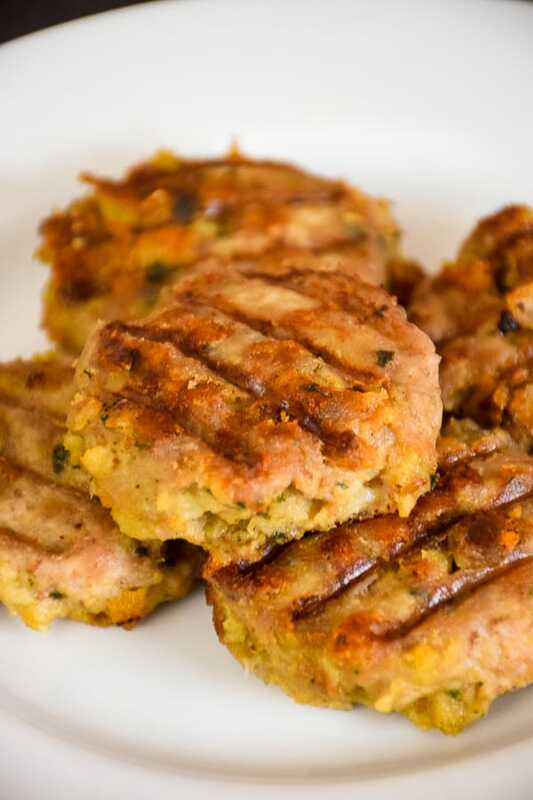 Be sure to Pin and Share Thanksgiving Turkey Burger Bites! This burger was created as part of a Girl Carnivore’s Burger of the Month challenge. 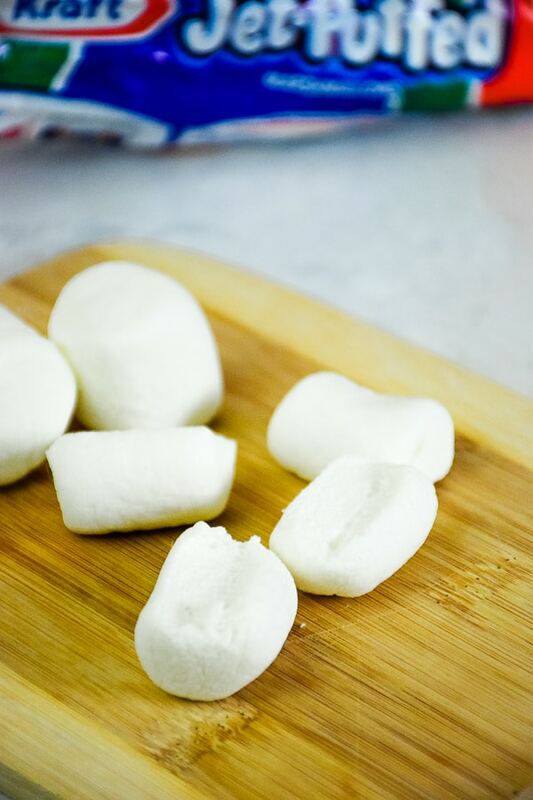 This month our secret ingredients were poultry, cranberries, sage, and marshmallows! If you want to be challenged also, be sure to hop over and request to join in! 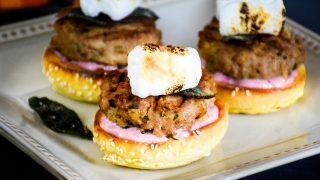 Thanksgiving Turkey Burger Bites bring together the sweet, salty and savory, flavors from your Thanksgiving table, including toasty marshmallow, cranberry sauce and leftover stuffing in incredibly mouthwatering burger bites! 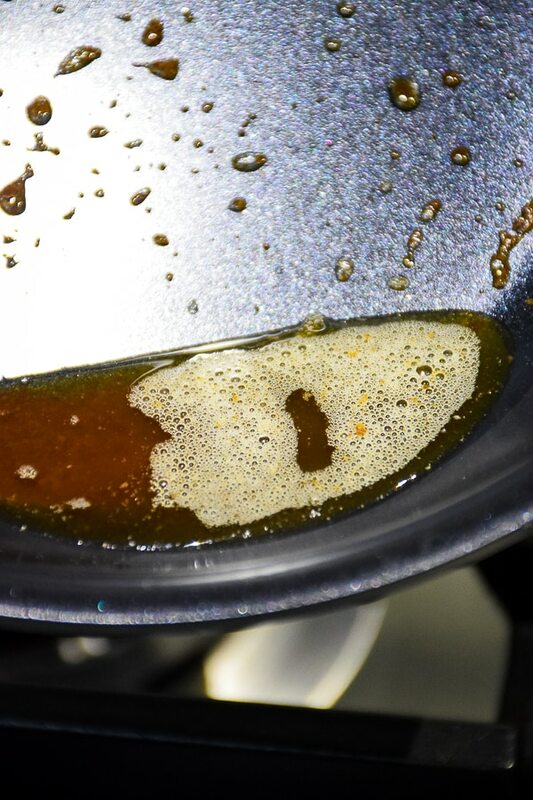 In a small skillet, over medium heat, melt 1 tbsp butter until just starts to bubble. Add fresh sage leaves. Fry until sage leaves start to change color, turning frequently. Don't let the burner get too hot, turn heat down if necessary. You don't want the butter to burn. Remove sage leaves and lie on paper towel to dry. Set aside browned butter you used to fry sage leaves. You will add this to your burger mix. Place ground turkey and leftover turkey stuffing in medium sized mixing bowl. Crumble 6 of the sage leaves into the bowl, then top with the browned butter from frying the sage leaves. Mix together with hands until combined. Spray slider pan with cooking spray. 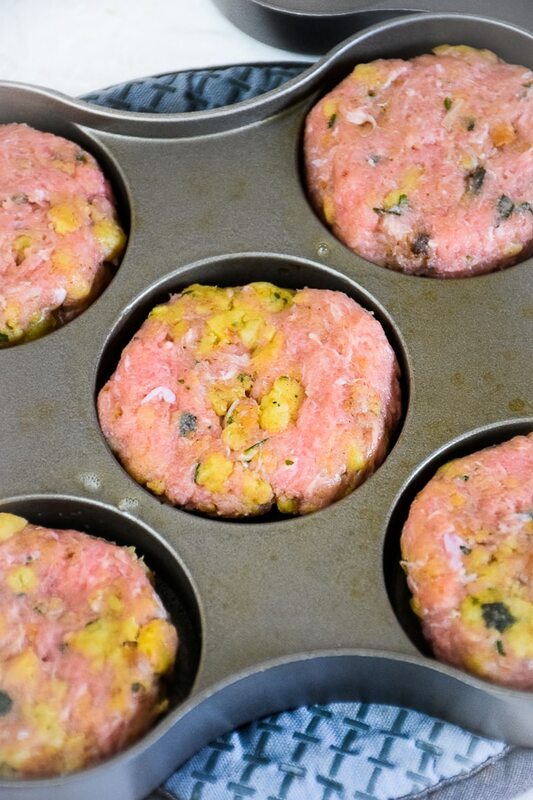 Shape ground turkey mixture into mini burger bites and place in slider pan. Put lid on top of slider pan and place pan over medium high heat and cook until burgers are done (about 5-7 minutes). Remove from heat. Leave lid on top of burgers until ready to assemble. 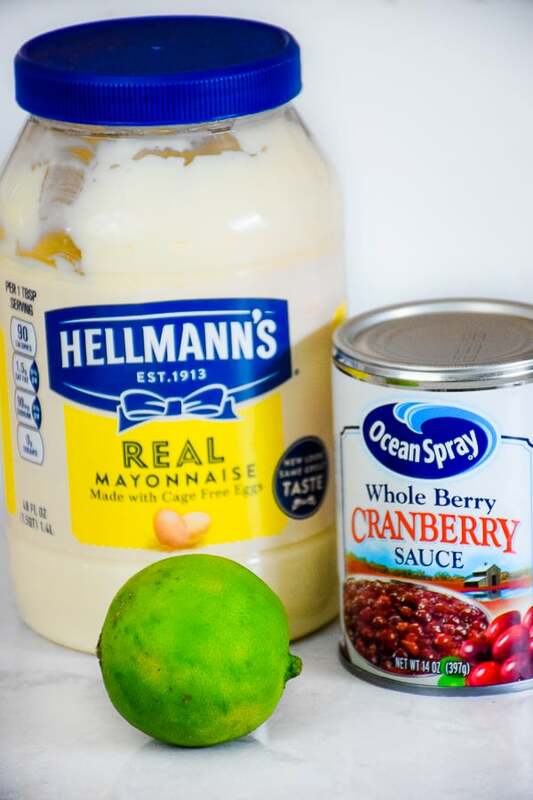 Combine mayonnaise, cranberry sauce, and lime juice until well blended. Butter mini burger buns and place under high heat broiler to brown. Watch carefully as they can burn quickly. Remove from oven. Spread a little bit of cranberry mayo on bottom of bun. Place mini burger on bottom of bun. Toast marshmallow as desired. I toast mine over my gas range. Be cautious when toasting the marshmallow as they can easily catch fire if they come into direct contact with flame or heat. 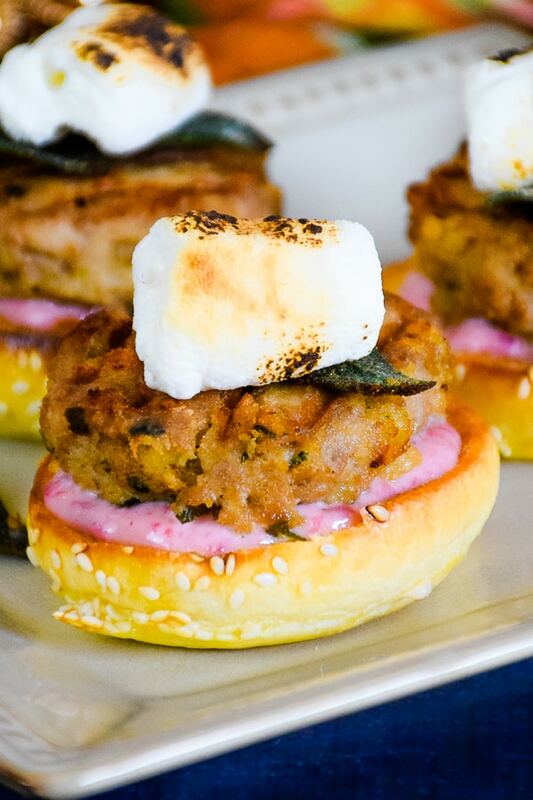 Top mini burger with toasted marshmallow.